Santa is back for another Christmas journey across the world, and this time, he is loading his sleigh under the brilliance of the Northern Lights in the chilly Alaskan air. Armed with an ice scraper and snuggled inside his heavy red coat, Saint Nick prepares the team of flying caribou. But the lead caribou Kotz is determined to get attention this year. He’s tired of people thinking that reindeer pull the sleigh, and he’s alerted the media and sent out press releases across the globe, seeking recognition and fame. It’s up to Santa and the gentle, selfless reindeer Star to teach Kotz the true meaning of Christmas and to bring toys to all the boys and girls of the world. Each caribou is named for an Alaskan town, and the book contains a pronunciation guide and trivia about caribou, Eskimos, and Alaska. 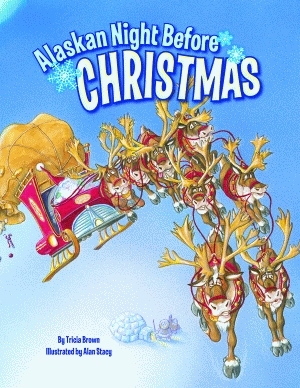 With beautiful imagery and flowing rhymes, Alaskan Night Before Christmas is a wonderful addition to any holiday collection. An Illinois native, Tricia Brown moved with her family to Fairbanks, Alaska, in 1978 where she earned a bachelor of arts degree in journalism. She spent twenty-one years in Alaska working in publishing and journalism, serving as the features editor of Fairbanks Daily News-Miner and editor in chief of Alaska magazine. She is considered an authority on Alaskan history and is the author of several books on the subject. Brown lives in Scappoose, Oregon. Alan Stacy is a self-taught artist whose style and technique is inspired by a variety of ancient and modern sources. He worked in broadcast television as a graphic artist and as a makeup artist for music videos, commercials, and theatre for many years. 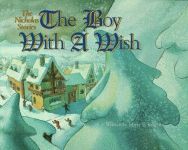 He is the illustrator of Texas Zeke and the Longhorn and Pennsylvania Dutch Alphabet, both published by Pelican.